Even though they didn’t work together well, the trio of Ronda Rousey, Becky Lynch, and Charlotte Flair all made short work of the Riott Squad. 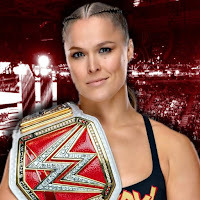 Rousey eventually tapped out Liv Morgan, and that’s when chaos erupted. Rousey started to attack her opponents when police officers came in and tried to separate them. Rousey struck an officer and was then handcuffed. Lynch took advantage of the situation and attacked her foe, which led to her being handcuffed. Charlotte Flair, not one to be left out, then attacked the two. Officers then led all three out of the arena in handcuffs. After Rousey and Lynch were put in a vehicle handcuffed, Rousey continued attacking until she broke a window. This led to the inept officers removing Lynch from the car and leaving Rousey alone, who then crashed the car into the other police car.